Children returned Thursday to Miramonte Elementary School in Los Angeles where the entire staff was replaced after the arrests of two former teachers on charges of committing lewd acts with students in class. Forty-five new teachers in 45 classrooms are replacing about 85 teachers removed from Miramonte Elementary School, according Los Angeles Unified School District (LAUSD) Spokesman Tom Waldman. 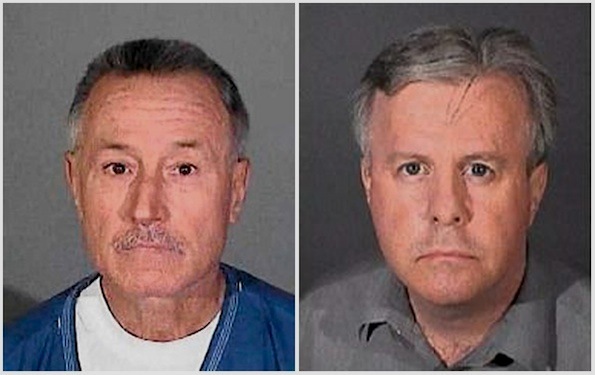 United Teachers Los Angeles officials said they believe that the district has no intention of ever allowing Miramonte’s 85 innocent teachers to return to the school, where two teachers, Mark Berndt and Martin Bernard Springer were arrested and charged with lewd conduct. Mark Berndt (left) and Martin Springer charged with lewd conduct (police photos). An investigation taking more than one year recovered photos from Mark Berndt at a South Bay CVS pharmacy following a search of the photo department’s computer system. Over 400 photos are involved — showing children with mouths taped over, blindfolded and sometimes eating from a spoon. Some children were photographed with a cockroach on them. Berndt was charged with 23 felony counts, was arrested in January and is being held on $23-million bail. He was a credentialed teacher and arrested after a period of over one year from when the original photos were discovered. Springer was charged with three counts of lewd acts upon a child on Monday and was arrested Friday. On Monday, Los Angeles Unified School District Superintendent John Deasy announced that he was replacing the entire staff at Miramonte to help restore parent confidence in the school. Many protesters — students, parents of students and teachers — say they want the 85 innocent teachers back. According to the LAUSD website, total K-12 enrollment for 2011-2012 is 664,233. K-5 is 274,193, Middle School (6-8) is 120,408, and Senior High School (9-12) enrollment is 152,507. Remaining data includes Charter Schools, Adult Education, Special Day programs, and Continuing Education and Opportunity Schools.